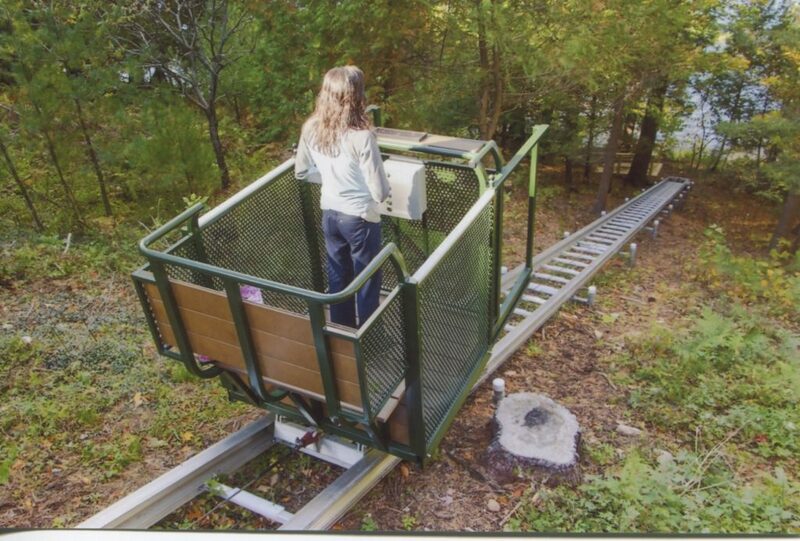 For those uneasy on woodsy paths and stairways, there is a hillside trolley adjacent to the two-bedroom Guest Lodge. Hillside trolley? Think tram or ski lift riding on a track. Step out of the Guest Lodge, down two steps and onto the trolley ten feet away. The trolley can provide transport 114 feet to the Boat House level, where seven steps lead to the dock. Passengers control the trolley movement by pressing "up," "down" or "stop" buttons in the trolley cab. The availability of the hillside trolley between the Guest Lodge and the waterfront is a unique feature of the Land's End property. The trolley can provide rides for those who may be challenged or anticipate possibly being challenged by aging legs or other mobility-limiting conditions. And the trolley is just 40 feet over sloping lawn from the 1876 House.